PUNE: In an era where success rate of start ups is still low, Ideas and Talent will play an important role, opined experts. 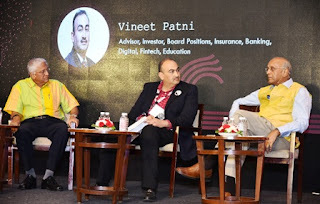 The Indus Entrepreneurs, a Not for profit making organisation organised the seventh edition of TiECON, a unique two day initiative for start ups at The Westin Hotel Koregaon Park. More than 500 start ups from across India took part in the event. In a jugalbandi session between start ups and grown ups moderated by TiECON 2019 chairperson Vineet Patni saw stalwarts and Corporate Advisor R. Gopal Krishnan and Angel Investor and mentor R. Narayanan share some interesting insights on startups and grown ups. R. Narayanan who has been deeply involved in start ups said that while the success rate in start ups is still low and the start up industry has to yet take off we should not be judgemental. Just like a baby tries to walk and falls down to get up again and in the process learns to walk, similarly we should not stress start ups what not to do, instead they should be given a free hand. R. Gopal krishnan said that start up is like a new baby born and one has to nuture it. The good thing is that they are young and have no boundaries and fear and then only thing they see is success and there is a learning process in free wheeling environment. Talking about ideas Paani Foundation Satyajit Bhatkal CEO Paani Foundation said that the water cup revolution started during the Satyameya Jayate series and we came across a startling fact that there is no problem in India which has not been solved but the solution has restricted to a specific area or village and has not converted into mass movement . So we have the know how but no scale and i think communication is the missing link between these two. Kiran Rao said that I am a city girl and my idea of village came from paintings, film shoots and didn't really get a chance to know more about them . Going to villages changed my perspective about my own life. At deeper level something had changed and felt more connected with people and in a sense a bright new world and connected to the vast nature.